The Hoyer Journey, a portable lift assist unit to aid those who experience difficulty standing, is packed with a list of features that make it #1 in the industry. This includes singularly unique features such as its ability to fold up for easy transport and storage. The Journey is the only stand-aid unit out there that has this capability. It's also the first on the market to utilize an adjustable cow-horn setup, allowing it to adapt to a variety of patient sizes – small, medium and large. Weight capacity for the Journey is 340 lbs, giving caregivers a quick and easy means to accommodate just about any patient. Under-bed clearance of only 4.3"
Maintenance of the Hoyer Journey's power system is made simple with the inclusion of an integrated Smart Monitor that stores and provides instant access to some important performance information. 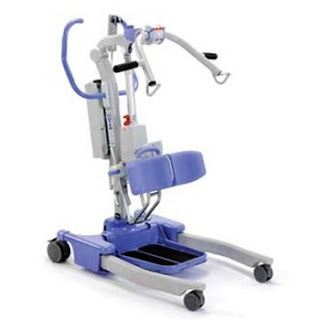 This includes feedback on the number of patient lift cycles completed, the amount of work done by the unit's actuator and the number of lifts attempted in excess of the recommended working load. The Journey works with small, medium or large standing slings, one of which is provided at no additional cost, and all three sizes of transport slings are available at an additional cost. This unit is currently being offered at 25+% below list price.